A large high pressure area is currently over most of the U.S. with another high pressure area off the coast. This pattern will hold through Monday. During this time Northern California will see clear skies with daytime temperatures 8 to 12 degrees above normal. Strong gusty north winds will occur through midday Sunday with light moderate north winds through Monday. Tuesday a weak closed low pressure area will form off the coast between the 2 highs (see map below). This system will linger off the coast through Friday and then weaken and move northeastward. At this time it looks like the main affect this system will have on our weather is to cool temperatures back to normal or a little below. There could be some isolated afternoon and evening thunderstorms over the mountains north and east of the valley Tuesday through Friday. If the low was to move closer the thunderstorms will be more widespread. Next weekend the high pressure ridge that is over the U.S. will push back to the west and this will bring back the hot weather to the north state. 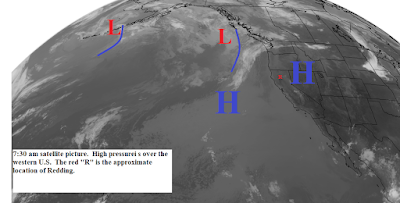 High pressure will continue over of just off the west coast for the next week and the the inland areas of the north state will continue to see sunny skies. Temperatures today and Thursday will be normal or slightly above. Temperatures will start to warm Friday and Saturday and Sunday high temperatures will be 8 to 12 degrees above normal. Winds will be light today and early Thursday. Thursday night through midday Sunday we will have strong and gusty north winds especially in the Northern Sacramento Valley. Early next week a low pressure trough will push into western Canada (see map below). The north state will still have mostly clear skies, but temperatures will cool back to near normal. High pressure will continue to dominate our weather for at least the next 7 to 10 days. However, the high will move from where it has been...over the western U.S....to further off the west coast....as shown on the map below. The inland areas of Northern California will continue mostly sunny for the next week. Temperatures will start to cool today, especially in the valley due to cool air moving inland through the Delta. Temperatures Tuesday through the weekend will run 2 to 6 degrees above normal. Winds will be light nights and mornings and then south to southwest in the afternoons today through Thursday. Friday through the weekend we see another round of gusty north to northeast winds. 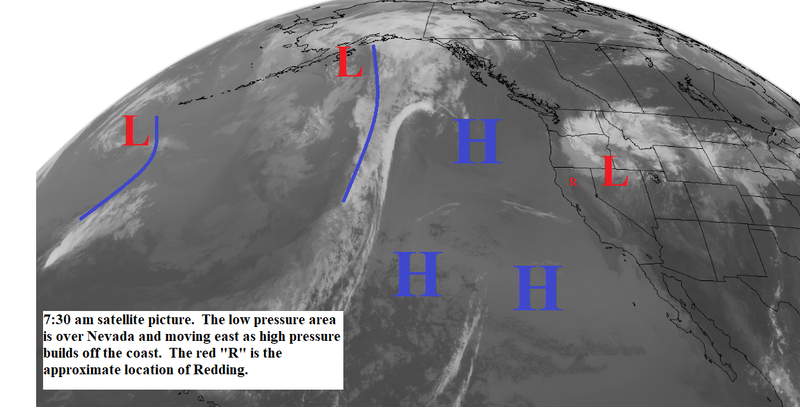 A strong high pressure ridge is over the west coast. Today and Sunday Northern California will be sunny and hot with some areas in the north valley reaching 105 to 110 degrees. Gusty north winds will occur today and early Sunday. Monday through next weekend we will under a normal summer weather pattern like the one shown on the map below. 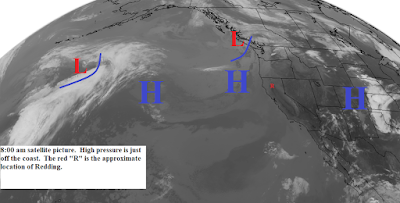 High pressure will be over the western U.S. and off the coast. Temperatures will cool a few degrees Monday and temperatures through the rest of the week should be 3 to 6 degrees above normal. Winds will be light with another round of gusty north winds possible next weekend. High pressure is over the western U.S. and off the coast. 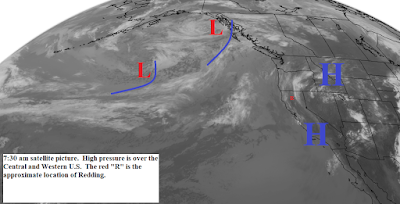 Today a weak frontal system is moving across the Pacific Northwest and western Canada. The southern end of this system will bring few clouds to the far north end of the state and could trigger a few thunderstorms near the Oregon border. The rest of the north state will be sunny with temperatures a little cooler. South to southwest winds will increase this afternoon. The high pressure ridge will strengthen over the next few days and dominate our weather for the next week (see map below). Thursday through next week will be mostly clear and hot with temperatures 8 to 12 degrees above normal by the weekend. Looks like the first "hot spell" of the summer. Winds will light except for gusty north winds Friday and early Saturday. The low pressure area that moved across Northern California this weekend is now over Nevada and is moving eastward. Today there will be a few clouds and isolated showers along and east of the Sierra Cascade Crest with mostly sunny skies elsewhere. Tuesday through at least the start of next week high pressure will be along and over the west coast (see map below). During this time the inland areas of the north state will be mostly sunny with above normal temperatures and light winds. 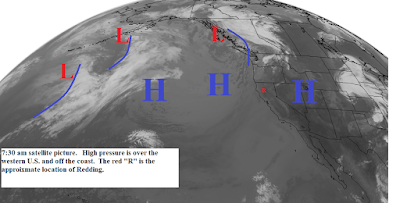 The closed or cutoff low pressure area is forming over Oregon. This low will drop southward across Northern California today and the move slowly eastward and will be over the Great Basin by Tuesday (see map below). The satellite picture (below) shows the low doesn't have much moisture with it. However, it will destabilize the atmosphere enough to trigger thunderstorms and showers as it moves through. This afternoon and tonight there will be scattered showers and thunderstorms over Trinity, Siskiyou, higher elevations of Shasta, Modoc, Lassen, and Plumas counties, with a chance of one moving over the valley north of Red Bluff. Sunday showers and thunderstorms will be confined to the areas north and east of Redding and Monday they will be along and east of the Sierra Cascade Crest. Temperatures will be a few degrees below normal through Monday. Gusty northwest to north winds will occur later today and Sunday. Tuesday through next weekend high pressure will be back along and over the coast. The inland areas of the north state will be sunny with above normal temperatures. 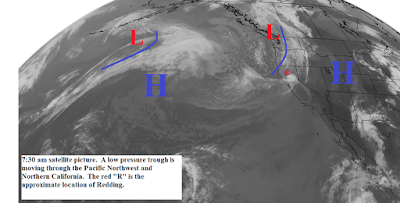 A low pressure trough is currently passing through the Pacific Northwest and the north end of California. This system will bring a few light showers to north coast, Siskiyou, Northern Shasta, Modoc, and Lassen counties through this evening. The trough will bring cooler temperatures and gusty southwest to northwest winds to all of the north state today. Sunday high pressure begins to rebuild over the west coast. Skies will be mostly clear. Temperatures will warm through Tuesday when temperatures will be 8 to 12 degrees above normal. Winds will be light. 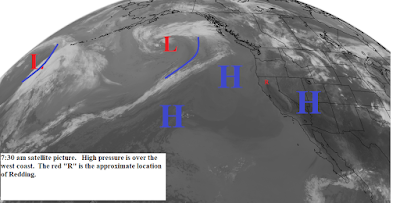 Wednesday through Friday the high will move back to the west as a low pressure trough develops over the Great Basin and the Central U.S. (see map below). We will still have mostly clear skies but temperatures will cool back to near normal by Friday. Gusty north winds will begin Friday. The weekend looks sunny and warmer with the gusty north winds ending by Sunday morning.